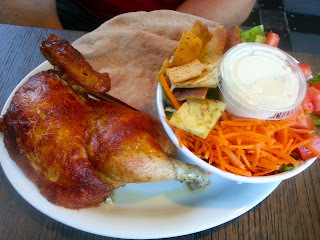 Today my husband and I ate lunch at the new California Chicken Cafe in Chatsworth. I had never eaten at a California Chicken Cafe before, but my husband had eaten at one while working on a shoot a couple years ago. He remembered it being good, but he didn't remember too much about it. It looked like a fairly busy lunch spot for local workers, a step up from a drive thru. There was a short line, but we didn't have to wait too long to place our order at the counter. Waiting actually gave us a chance to look over the menu and watch the workers prepare other people's orders. It's kind of reassuring when you can see the roasted chickens being cut apart and the salads being assembled. I like being able to see the fresh ingredients. I decided to go with the 411 Salad which is basically a make-your-own salad. I selected peppers, green onions, tomatoes, Parmesan, and white meat chicken for my salad toppings with low fat ranch on the side. 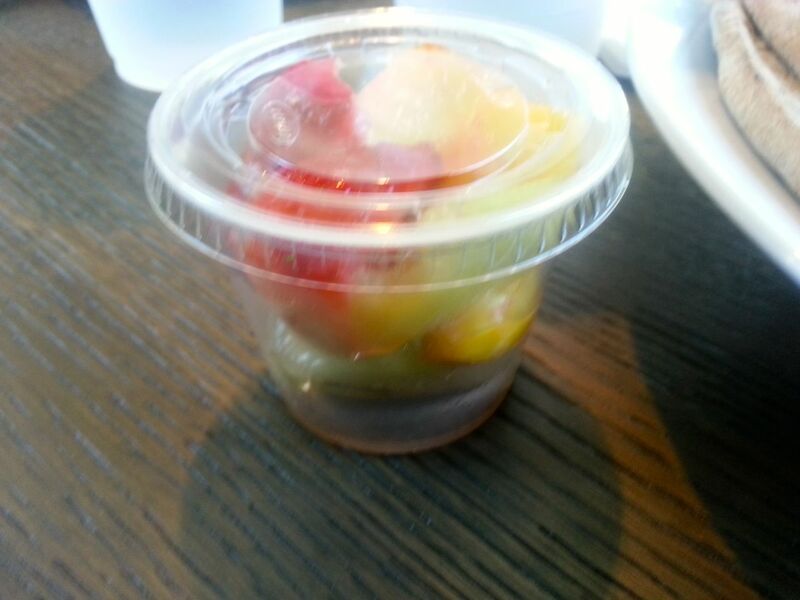 It came with my choice of white or wheat pita bread (I chose wheat) and a side (I chose the fruit salad). My husband ordered the 1/4 chicken with one side, and he chose a garden salad. 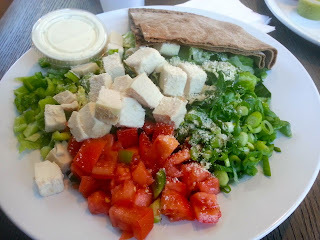 His meal also came with pita bread, and he chose wheat as well. 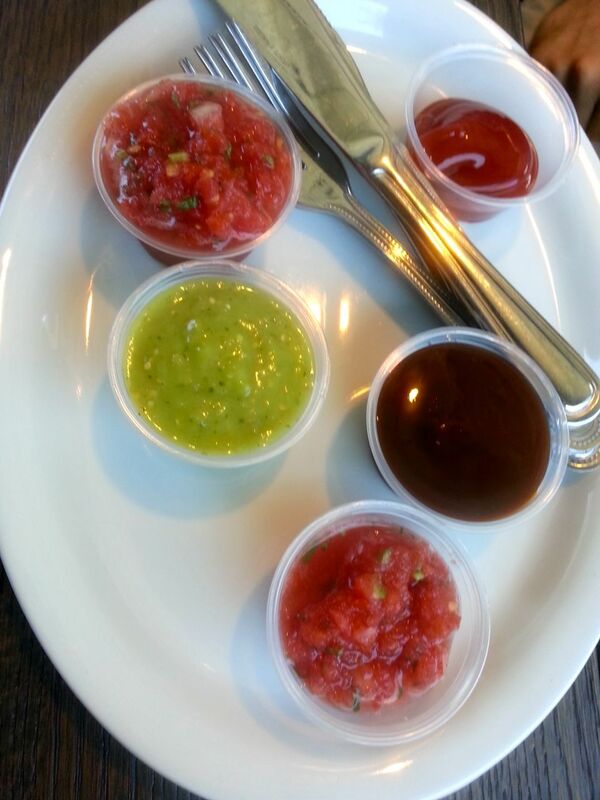 We filled our plastic glasses with water, chose dipping sauces from the condiment bar (BBQ, salsa, ketchup), grabbed napkins and silverware, and selected a table on the enclosed patio since it was a little bit less crowded. I really liked the way lights were strung across the ceiling of the enclosed patio space. I would love to replicate that in my backyard. The only downside was how loud the chairs were out there. There was a lot of cement, and the metal chairs really echoed every time anyone moved their chair at all. It made it kind of hard to hold a conversation. I was really impressed when our food was brought to our table. My salad was huge! I loved that the lettuce was romaine instead of iceberg, and the chicken was super juicy. The low fat ranch had a nice flavor. I liked the salsa okay, but it wasn't very spicy. I dipped a piece of pita in the BBQ sauce, and it was pretty good. My husband's order was a nice size too. He said he'd get it again. The chicken was juicy, tender and practically fell off the bone. The croutons on his salad where kind of like pita chips. It was all good and fresh tasting. You can probably see the similarities between this restaurant and Stonefire Grill, which I reviewed a few days ago. (Click here to read my review of Stonefire Grill.) In both cases, you order at the counter, you get plastic cups for your water, you pick up your own silverware, there's a condiment bar and your food is brought to your table. My husband and I even ordered similar things at both places. I got a salad at each place, and the salads cost about the same. My husband just had chicken today as opposed to chicken and ribs at Stonefire (they don't have ribs at California Chicken Cafe). His meal today also cost a little less. We like California Chicken Cafe significantly better than Stonefire Grill. The food is fresher. The servings are bigger. There's more atmosphere. It's a great lunch spot. You need to be in the mood for chicken, but they do have vegan and vegetarian options; you can get meatless salads, soups or wraps. They also sell whole chickens, so you could bring home a roasted chicken dinner for your family. There's no competition. Pick California Chicken Cafe over Stonefire Grill every time. Now how does California Chicken Cafe compare to Chick-fil-a? Hmm. (Click here to read my review of Chick-fil-a.) The food at California Chicken Cafe seems fresher, and the chicken is probably healthier since it's roasted chicken instead of breaded chicken. I also like that you have more flexibility to customize your order. California Chicken Cafe is a better choice for a bigger, fresher salad, but it won't cure a craving for nuggets or a breaded chicken sandwich. I think they both serve a purpose. It just depends what kind of chicken you want. I'm sure I'll eat at both places again.